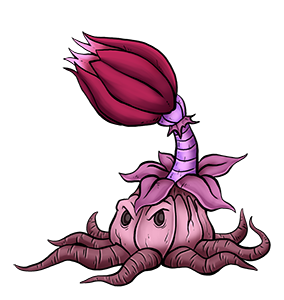 Although a wild carnivorous flower Kreature makes up its base genome, it is augmented with the DNA of various beast-type Kreatures as well. As a result, it has blood, a heart, and even a rudimentary nervous system. It stinks like rotting fish and its leaves are said to taste like meat. Its vision is somewhat crude, so it picks up vibrations through its roots to sense the approach of its prey. It shoots pellets of condensed pollen from the flower on its head, which explode on impact and cause severe chemical burns to its victims.